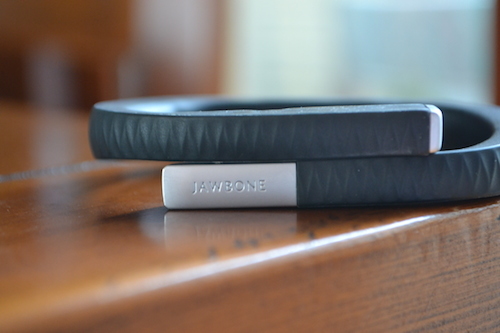 A couple of months ago I decided to buy the famous Jawbone UP. What’s that? It’s a solid rubber bracelet that tracks all your activities, day and night. 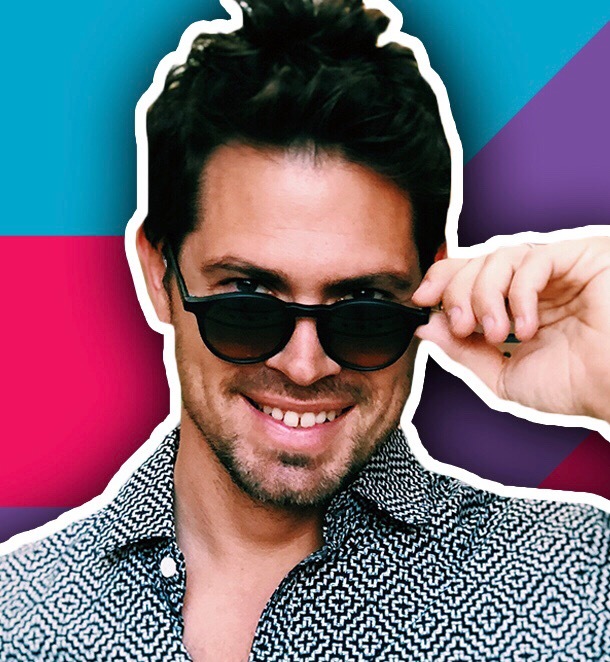 The California based company has created something really unique and interesting, particularly for sporty people and all those who are interested in changing their health habits. I tried it in every functionality and it’s now an integral part of my day and night life. This is an overview of all the key features and why this fitness bracelet can change your lifestyle. Let’s start from the surface. 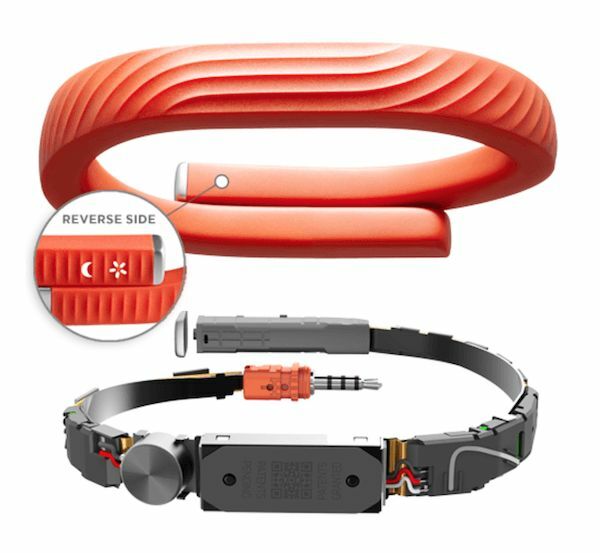 The wearable device is a light rubberized wrist bracelet you can simply wear all day long. It is available in different colors and it has a good-looking design. I decided to buy the black one because it’s the most discreet and you can wear it even if you are dressed up with a business suit. Moreover, scratches are less visible. You can decide three different sizes because the bracelet literally “hugs” your wrist and you must choose the most suitable for you. Having UP all day long is not annoying and you can take a shower and get wet without any problem. It is waterproof, so it’s suggested to take it off when you are going for a swim or a dive. The structure it’s pretty elastic so you can enlarge it when you put it on, but carefully. I don’t have any particular problem wearing it all day long, except when I put a backpack on or when I take off a sweater. In this few cases, sometimes, the bracelet tail get caught and you get hang somewhere. 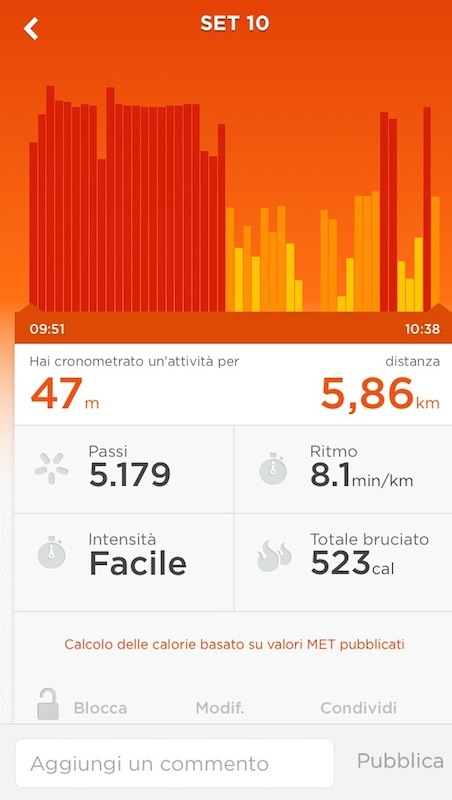 As I said before, UP is a fitness bracelet that helps you track your activities and your habits. You have two different options: the day tracker and the night tracker. To switch from a mode to another you just need to push the button on the top of it and with a vibe and a light it will show you which one is on. Little sun, day mode, little moon, night mode. When you are in day mode you will track your steps, distance and calories during the day. Based on your age, gender, weight and height it also tells your ideal body activity for every day and the daily percentage of the goal you have reached. You can also set alarms for extended periods of inactivity to spur you stand up and move. This function is very useful if you are working in front of a computer all day long. UP, with a vibration, will remind you to stretch your body! UP is good especially if you are a runner. You can register a specific period of time and UP will store all the information that you can than upload in your app. With the timer, you can track any activity and metrics such as rhythm, steps, distance and calories burnt. To start the timer you just need to double push the tail button and the day symbol will light up three times. Another useful tool is the alert. You can set up different alerts and reminders during the day and UP will warn you with a vibration and a push notification on your smartphone. Example, you need a reminder to buy milk, just set the alert at the time you prefer and you are done. In the app you can also add food and products, scanning the bar code with your smartphone’s camera, and integrate your diet in the system. In this way Jawbone UP will calculate the total calories you are burning during the day and add the calories you are taking. I don’t use it a lot, since you have manually to add food and drinks, but it can help people who are following a diet. The second main function is the night mode. Actually, I believe this is great and the one I appreciate most. When you get into bed you need to push the button of your UP and activate the night mode ( a moon will light up and the bracelet will vibrate). Than just sleep! 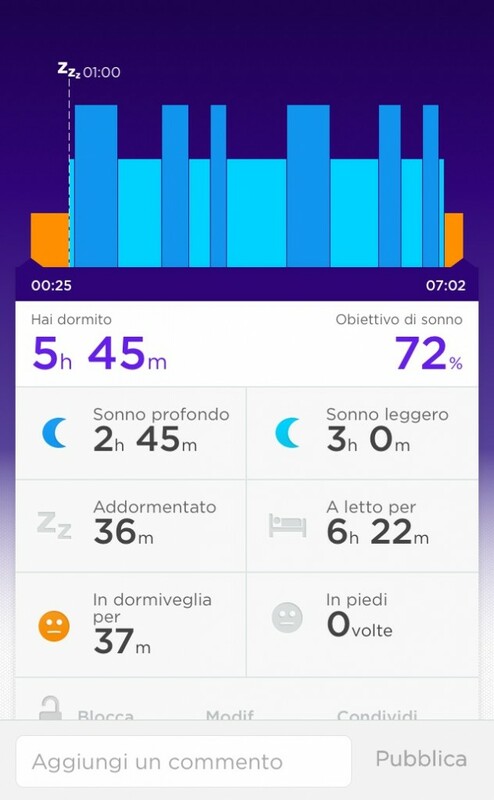 When you wake up, after the synchronizing with the app, you will see in a stat all your sleep phases. But the top feature is the Smart Alarm: with this feature you can set a time to be awakened with a specific minutes range (5,10,15 minutes) and UP will wake you up in a light sleep phase. What does it mean? When you are in a light sleep phase the awakening is less traumatic and you will get up of bed more fresh and rested. I personally love this feature because it doesn’t use sound alarm but just a kind vibration that you will feel on your wrist. If you are hard sleeper don’t worry: it will continue vibrating until you turn it off! And also, you can set up a specific time alarm so it will wake you up even if you are not in a light sleep phase. Jawbone created a all-healthy community of fitness lovers who love to share their results and tips. That’s why with the app you’ll be able to add your fiends to a group and see their stats and results. This gamification system spins users to challenge themselves with goals and health habits and also, to check more often the UP’s app. For example you can add your partner and see her progresses. This social side is also a nice feature for fitness enthusiasts! As I said in the title, UP really changed my habits and lifestyle. It’s a funny way to monitor your body and improve it through numbers, stats and goals. 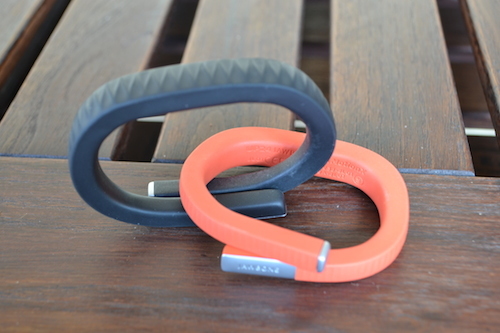 The bracelet comes in two versions: UP and UP24. The difference is that with UP24 you can sync your bracelet just via Bluetooth and you don’t need to sync it “physically ” via the headset port. This is a pretty good add value since you don’t have to take it out every time. The in-app health tips are also interesting: Sometimes, when you open the app, you will see brief tips on how to improve your habits and live better. Nice design and light weight. You can wear it day and night with no problems! There are no LED screen displaying info, nor time. If you buy UP you need to plug it into your phone every time you want to sync it. If you think this review was useful or it might be interesting for a friend of yours, share it! If you have any questions, notes or comments just drop it below!